Relatively speaking, it's easy to start a webcomic, if you have the money to get the server space going. To do it right takes lots of hard work and dedication, which any long-time veteran of the webcomics scene will tell you. To have three stories (two complete one in progress) that always update regularly, plus side-stories as time, money, and interest allow is quite an accomplishment, and that's just what Evan Dahm has done. Without a lot of fanfare, Dahm has built himself a world that is both interesting and incredibly well drawn. Evan started with Rice Boy, back in 2006. He describes it as a surreal fantasy story, and that fits. After all, one of the first characters we meet is a machine being whose face changes every time we see him to a different black and white still shot. He wants help with finding someone and the story expands from there into a large cast of characters, including the titular Rice Boy, who is probably the most simply designed character of them all. As the story progresses, it gets increasingly strange creatures as Dahm moves the story bit by bit and we discover more of his innovative world. Order of Tales Came next, and featured a new set of characters and time period. (Disclosure: I have only sampled this one. I really need to get back to it.) This one follows a character who is the last storyteller, involved appropriately enough, in lost history. The work here is amazing in its use of black and white, using dark space to create a mood, thick linework to enhance details, and an overall improvement in Dahm's craft. 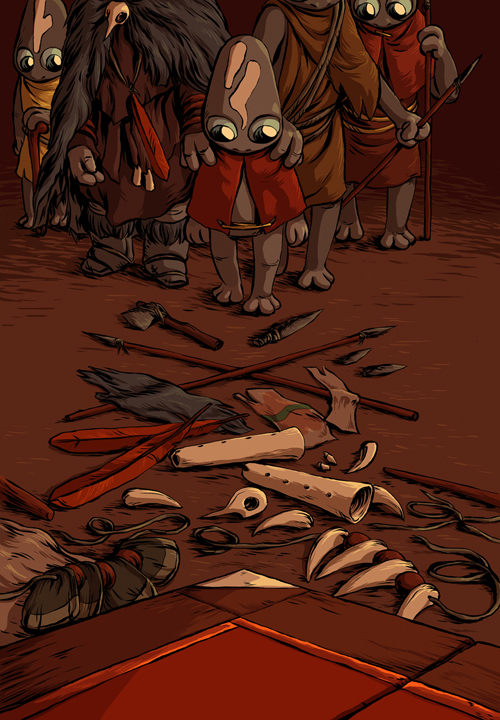 The current storyline is Vattu, a print of which I've featured above. It shows Dahm, in a return to color, using differing shades to enhance the elements of his panels, just as he used shading in Order of Tales. Vattu is about a nomadic tribe and its struggles, playing out across three-times-a-week updates. A series of webcomics so well-established are hard to get into sometimes, but I appreciate the Dahm has his site so well organized. It makes starting and catching up incredibly easy for a new reader. He takes his work seriously, and the results show, both in professionalism and in the quality of art and story. Evan will be at SPX again this year, with his printed versions of Rice Boy and Order of Tales. He may also have his Art Book from Benign Kingdom, which I think are printed now. If you like epic fantasy mixed with strange things (Hi there, Saga fans! ), definitely check out Evan's body of work. I think you'll come away as impressed as I am. Lost in you own epic and can't make SPX? You can find Evan's comics on the web here, with a link to his store to buy the books directly from him.